November | 2011 | Where in the World Are Our Kids? If you’d like to order from our Online Pampered Chef Party, now’s your last chance! Today is the last day! Believe it or not, there are a lot of things from Pampered Chef that I don’t own! Besides the things that I’ve already mentioned, here are things that I don’t have that I think look really neat. The microwave chip maker! I must admit, my love of potato chips is not good. I should never buy them, because I eat them! The chip maker allows one to make healthier chip options like sweet potato chips or apple chips. Yum! I’d love to try this! And because thin slices are mandatory for making chips: the Simple Slicer. I take breakfast for the college students on Sunday mornings, and a big bowl would be great. Unfortunately, with a small kitchen, bowl storage is tight. Which is why I like the Collapsible Serving Bowl! The small ridged baker can be used in the microwave or the oven, and can raise foods out of fats and water. Who can’t use more Twix-it Clips? I use these on everything. Which is why I need more. And since we eat a lot of cilantro, which has a tendency to spoil quickly, I’d love to give the Herb Keeper a try. Tomorrow is the LAST day for our Online Pampered Chef Party. Don’t forget to place your order before it’s too late! You may not be aware of this, but Ken actually spends almost as much time in the kitchen as I do. When our schedules sync and we’re at home for dinner at the same time, we often cook together. He’s familiar with every Pampered Chef product in our kitchen, and a few days ago I asked him what his favorite Pampered Chef Product was. The Food Chopper? The Pizza Stone? The Crinkle Cutter? His answer surprised me: The Nylon Pan Scrapers! Made specifically to be used with the Pampered Chef stoneware, these hard plastic scrapers have flat sides and curved edges to scrape flat surfaces and corners alike. We use them not only with Pampered Chef stoneware, but on all of our dishes that have stuck on food or to even scrape food off of plates before putting them in the dishwasher. It is great to use on non-stick cookware as well. Simple, but effective! And for only $2.75 for a product that will last you decades, I don’t think you’ll find a better deal for kitchen supplies! Thanks for participating on our Online Pampered Chef Party! Remember, there are only two days left! Pampered Chef’s Crinkle Cutter is awesome. It can power through vegetables and cheeses, and even leaves a decorative edge that is kinda cute, but I love it for cutting serving size pieces of pizza or lasagna. The handle allows you to put more leverage on the blade, cutting through even tough crusts. This cutter has some muscle . . . or allows me to use mine! Preheat oven to 400o. Spread pizza crust dough on pizza pan. Bake for 10 minutes. Remove from oven. Toss shredded chicken with cumin and garlic salt; heat in microwave for 2 minutes. Combine tomato sauce and diced tomatoes. Spread evenly on crust. Spread corn, onion and chicken and sprinkle on pizzas. Sprinkle on pizzas. Place in oven for 10-15 minutes until cheese is melted. Let pizza cool for several minutes until cheese is set. Cut slices with the Crinkle Cutter! Thanks for shopping our Online Pampered Chef Party! Remember, the party closes November 30th! 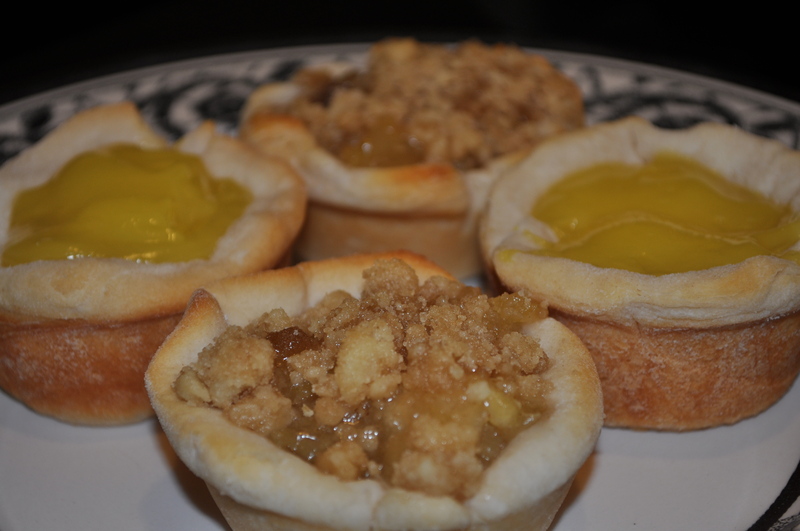 For Thanksgiving dessert, we had mini-pies — lemon and apple. I saw this idea on Pinterest, and had to give it a try. Cute and easy! The only ingredients really necessary are canned refrigerator biscuits and pie filling. 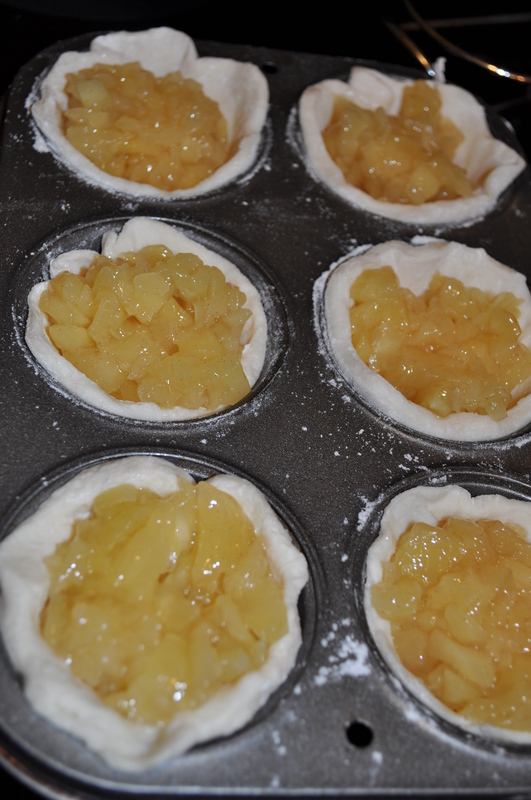 In fact, for the lemon pie, that was all we used. Pull each biscuit in half (easier with flaky biscuits) so that you have two thin biscuits. 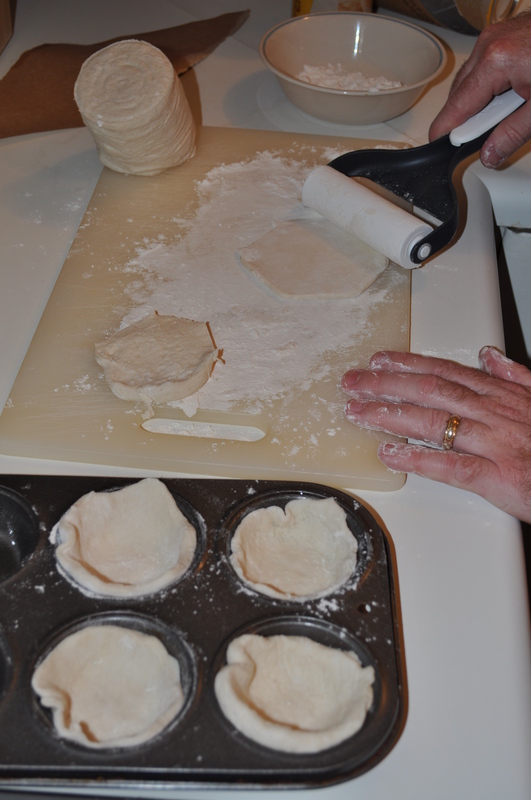 Roll them out on a floured surface, then press inside a sprayed muffin pan. The roller that Ken is using in the picture is the Pampered Chef Baker’s Roller. It’s great for rolling out biscuits, crescent dough, and even pizza crusts. Spoon with a generous amount of pie filling. 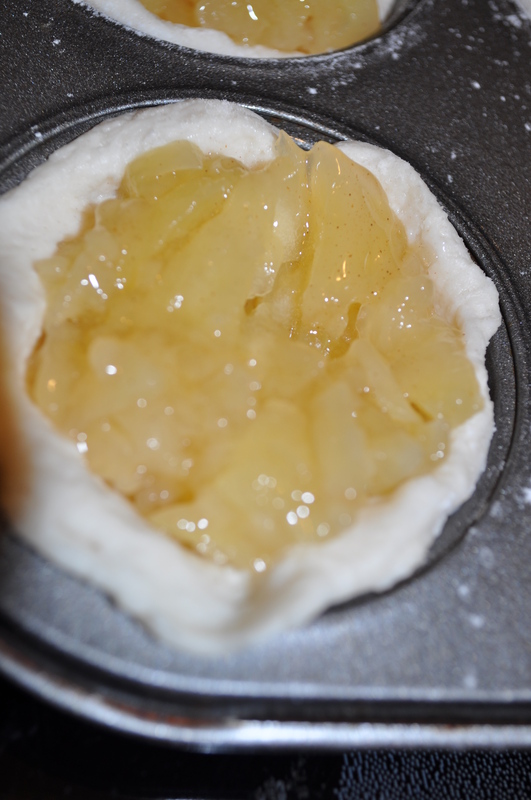 I used the Food Chopper to chop the apple pieces in the pie filling into small chunks. For the apple pie, we made a streusel crumble on top with equal parts brown sugar and flour, and a few tablespoons of butter mixed together. For the lemon, we skipped meringue (because I don’t really like it). Bake for 15 minutes, or until crust is golden. Enjoy topped with whipped cream or a scoop of ice cream! I know we have! Thanksgiving holds a special place in our hearts. Sixteen years ago, on Thanksgiving day, Ken and I had our first date. Our first meal together was Thanksgiving dinner, cooked by myself and eating late at night because of Ken’s arrival time. He had flown down to the United States to celebrate American Thanksgiving, and we had a great weekend together, experiencing many of the holiday traditions in Indiana. With our family being at least 3 days drive away, Thanksgiving has most often been a holiday shared by the two of us — an anniversary of sorts. For years, I cooked a turkey, made stuffing, glazed carrots, baked potatoes, green bean casserole, cranberries, rolls, pumpkin pie — all of the traditional Thanksgiving day dishes. Then one year we happened to find that Cracker Barrel serves Thanksgiving dinner at a very reasonable price. We spent a few years eating at Cracker Barrel, and then even tried their Thanksgiving dinners to go. When I found I was allergic to corn, potatoes, and carrots, the Cracker Barrel Thanksgiving dinner had to go. In fact, much of traditional Thanksgiving had to go. That’s when we realized: if it’s just the two of us, why do we let cultural expectations determine what we eat anyway? We began to rethink how we celebrated Thanksgiving. If the traditional side dishes of Thanksgiving are out, who needs turkey? Our favorite celebratory meat is steak! So for the past few years, we’ve eaten steak on Thanksgiving, along with our favorite sides, now that I’m not allergic to them anymore. 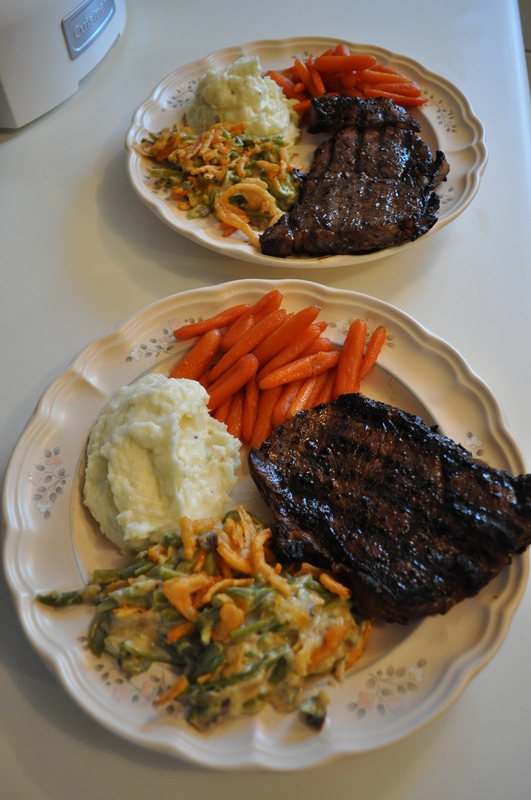 Yesterday we added glazed carrots, green bean casserole, and blue cheese mashed potatoes. And dessert? I’ll tell you tomorrow! Blue cheese mashed potatoes? YES. And they are delicious. They were inspired by the Blue Cheese Au Gratin potatoes from Old Hickory Steakhouse, but a whole lot less time intensive to make. They are a perfect side to a nice steak. Or even a not-so-nice steak! Bring water to boil in large pot and add prepared potatoes. Boil until fork tender. While potatoes are cooking, melt together heavy cream, butter, and blue cheese. Drain cooked potatoes and place in large bowl, pour cheese mixture over potatoes and mash together. Salt and pepper to taste. To mash potatoes, I use a combination of a fork and a brief mix with a hand mixer (so they don’t become pasty), but what would be even better to use (if I had one) would be the Nylon Masher! I have other Pampered Chef Nylon tools and they are so much more durable than other plastic tools I’ve owned. And for only $6.50, it’s a great price! Don’t forget, there’s just a few days left to join our Online Pampered Chef Party! The party closes November 30th! A year ago this week, we had just finished our homestudy, and were anticipating an adoptive foster care placement by the end of the year. This Thanksgiving, we’re still waiting. No longer for a foster care placement, but to fly half way around the world to adopt a small boy and a girl waiting in an orphanage. It seems like we’ve lived through five years in the last one. We’ve experienced some of the worst of humanity, and even more of the best. Our children are also experiencing some of the worst of humanity, and we hope to bring some of the best to them. We don’t know the circumstances surrounding their being orphaned, but there’s simply no way that they’re anything short of tragic. I find it remarkable that out of brokenness, theirs and ours, is the beginning of a beautiful story. And it was out of Christ’s brokenness, and my brokenness, that the beauty of our adoption into the family of God began. The brokenness of the last year sits heavy on my soul, but for this, I am thankful: Brokenness begets beauty. Do “Practical” Gifts Make Good Christmas Presents? “Is it okay to give someone kitchen gadgets for Christmas?” my husband cautiously asked when I told him we were having an online Pampered Chef party for adoption. Here’s my take on “practical” gifts. I think the secret to great Christmas gift-giving is knowing that you’re buying something that the gift recipient would love but wouldn’t ordinarily buy for themselves. Maybe the item is more expensive than something they’d buy for themselves, or better quality than something that they have that is adequate, or solves a problem or meets a need that the person has (even if they don’t know they have it). Let’s face it, none of us need a pearl necklace, a cashmere sweater, or an remote car starter, but the thoughtfulness of those gifts is appreciated because they’re not something we’d typically purchase for ourselves. I think of much of Pampered Chef products in the same way. Do I really need a new pitcher for drinks? Probably not. But would I really love a Family-Sized Quick-Stir pitcher? Yes! We stopped drinking carbonated beverages about a year ago, which means we make a LOT of Crystal Light and Country Time Lemonade, and the Family-Sized Quick-Stir pitcher would make that easier. I have the smaller size, which I love, but find that I have to refill it almost every meal, so I’d like the upgrade! Regular measuring spoons for Christmas? Probably not. Adjustable measuring spoons for Christmas? I’d love them! That’s my take on practical gifts for Christmas. Consider the recipient. Is the item more expensive or of nicer quality than the recipient would buy, or does it solve a problem or meet a need for them? Those make perfect gifts! What’s your take on “practical” gifts? Do you like them? What Pampered Chef products would you like for Christmas?